Background: Welding is a common industrial process associated with various health hazards. The aspect of duration of hazard exposure among welders at their workplace has been studied to limited extent in India. Objective: To assess the duration of occupational hazard exposure and its association with symptoms among the welders. Materials and Methods: A cross-sectional study was conducted amongst 106 welders in North Delhi. Data was collected using a questionnaire containing items to assess the socio-demographic profile, their medical history and individual hazard exposure. Results: Majority of them were involved in skilled/semi-skilled job (n = 99; 93%). The predominant nature of work for majority was manual. More than half reported their work to be physically hard (n = 56; 53%), involves much lifting of weight (n = 61; 57%), and is dangerous (n = 59; 56%). Dust/smoke followed by noise was reported to be most common hazards at the workplace by them. Most of them were suffering from eye related symptoms (n = 63; 59%) followed by skin conditions (n = 28; 26%). 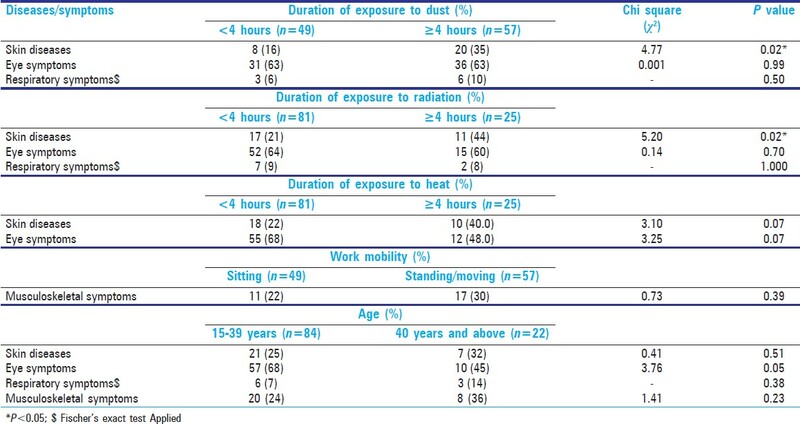 Skin diseases were reported to be significantly common among group of welders who were exposed to dust and radiation for ≥4 hours in a day (P < 0.05). Conclusions: Nearly half of the welders found their job to be dangerous and were being exposed to at least one hazardous substance at their workplace. Majority of them complained of eye symptoms. There is a need for health and safety training of this economically productive group. The health risks associated with welding gases and fumes are also determined by the length of time one is exposed to them, type of welding engaged in, the work environment and the protection employed. Hence, it is pertinent to keep exposure to harmful gases and fumes below recommended Occupational Exposure Limits (OELs) and for limited duration to curb ill effects on health. However, the aspect of duration of hazard exposure among welders at their workplace has been studied to limited extent in India. Welders are part of informal occupational sector in India. Hence, they do not have any organized occupational health services. Further, very limited attempts have been made to study occupational exposure and health profile of this population in India. Therefore, the present study was undertaken to assess the duration of occupational related exposure to various hazards and health of the workers. It was a community based cross-sectional study conducted among welders working in Pooth Khurd village near Bawana Industrial Area of North-west district of Delhi. It is a village located near Delhi-Haryana border and consequently has lot of migrant population from the neighbouring states. According to census 2001, the population of the village was 8,167. More than 75% of the males in the village are employed outside the agriculture. Being located near an industrial area, there are numerous mechanic workshops, motor spare parts market and small-scale industries. Welders are located around these workshops. 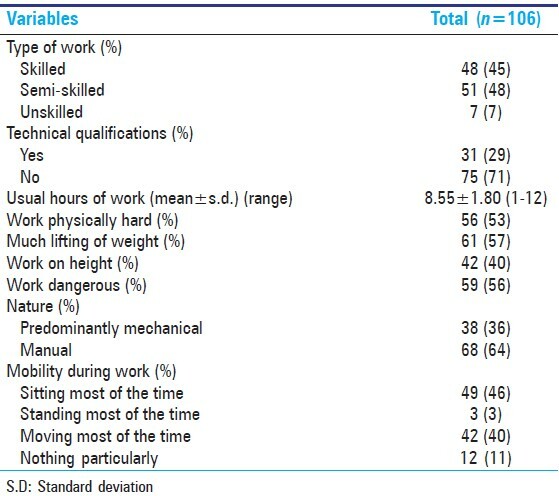 Taking prevalence of morbidities among welders to be 50% (as there are no available studies in the Indian setting) with 95% confidence interval and precision of 10%, sample size was estimated to be 96. However, 106 welders working in the area consented to participate. All workers above 15 years of age, involved in Manual Metal Arc Welding for at least 1 year were included in the study. A pre-tested, semi-structured interviewer based questionnaire was used for data collection. The questionnaire was prepared after a rigorous literature review. , The questions were then assessed for suitability, relevance and accuracy in the Indian context by a professional occupational health specialist. The interview schedule was pretested on 35 welders from Gokulpuri in East District of Delhi. The alpha Cronbach coefficient of the questionnaire was calculated to assess internal consistencies of items and was found to be 0.67. The schedule included questions pertaining to age, gender, state of origin, marital status, education, job status, income and type of housing of the study participants. The schedule also included seven items for assessment of nature of work and exposure to chemicals, heat, dust/smoke, noise, radiation, cold, vibration and fumes on daily basis. Exposure was calculated in hours per day. Past history of diseases such as jaundice, skin diseases, burns, allergy, low back pain (LBP), tuberculosis, joint problems, hypertension, respiratory symptoms such as breathlessness, cough etc., and eye related symptoms in last one month and last one year were elicited from the participants. Symptom classification: Watering of eyes, photophobia and redness of eyes were referred to as eye symptoms, LBP and joint problems were classified as musculoskeletal complaints/diseases and breathlessness and cough was defined as respiratory symptoms. Before the commencement of the study, a thorough search of welding small-scale industries and mechanic work shop was undertaken. After mapping these places, welders were located and contacted. A three-member team led by the investigator interviewed the welders present on the day of survey and involved in Manual Metal Arc Welding at their workplace. The objective of the study was explained to them and informed consent was obtained before the collection of data. The option to opt out of the study was kept open without any clause. Confidentiality of data was ensured. The ethical committee of the institution approved the protocol of the study. The data collected were coded, entered into Microsoft Excel 2007, and analyzed using Statistical Package for the Social Sciences software (SPSS 16.0, SPSS Inc., 233 South Wacker Drive, 11 th Floor, Chicago, IL 60606-6412). Descriptive statistics, including mean, standard deviation, and range, for quantitative data and proportions for qualitative data were used to characterize the study population. For qualitative data, χ2 or Fischer's exact test was used to observe differences between proportions for independent groups. The difference between the 2 groups was considered significant at 5%. Overall 106 male welders consented to participate. The mean age of study group was 30.96 ± 11.33 years with 79.2% (n = 84) belonging to 15-39 years age group. Majority of the respondents were married (n = 68; 64%). Nearly one-third of the participants (n = 33; 31%) were educated up to primary level, whereas 27% (n = 29) were illiterate. Out of all, 75% (n = 80) of the participants were residing in resettlement colonies. More than half of the respondents (n = 63; 59%) were from Uttar Pradesh (UP) and only 22% (n = 23) from Delhi. The mean time in years for which the study group has been Delhi was 18.09 ± 13.23 [Table 1]. There were only seven welders (7%) who were doing unskilled work while rest of them were either involved in semi-skilled (n = 51; 48%) or skilled job (n = 48; 45%). A large proportion of welders (n = 75; 71%) did not possess necessary technical qualifications related to welding. The usual hours of work was reported to be 8.55 ± 1.80 (range = 1-12 hours/day). More than half of the respondents reported that their work to be physically hard (n = 56; 53%); involves much lifting of weight (n = 61; 57%), is dangerous (n = 59; 56%) and nature of work is manual (n = 68; 64%). While 46% (n = 49) said that their work involves to be sitting most of the time and 40% (n = 42) reported to be moving most of the time [Table 2]. 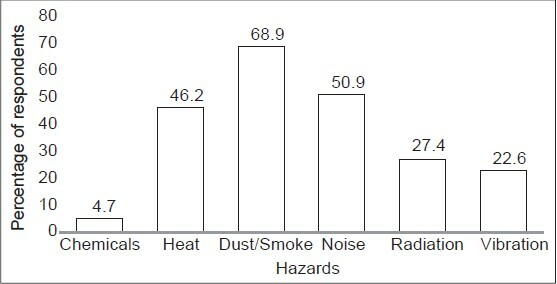 Dust/smoke (n = 73; 69%) followed by noise (n = 54; 51%) were reported to be most common hazards at the workplace by the welders. Chemical exposure was reported the least (n = 5; 5%) [Figure 1]. The study participants reported that they were being exposed to dust/smoke for 4.41 ± 2.76 hours (Median = 4; interquartile range (IQR) = 2-6 hours), radiation for 2.01 ± 3.35 hours (Median = 0; IQR = 0-3 hours), noise for 2.67 ± 2.71 hours (Median = 2; IQR = 0-5 hours) and heat for 1.92 ± 2.85 hours (Median = 0; IQR = 0-3 hours). The mean duration of exposure to chemicals was negligible (<1 hour) [Figure 2]. 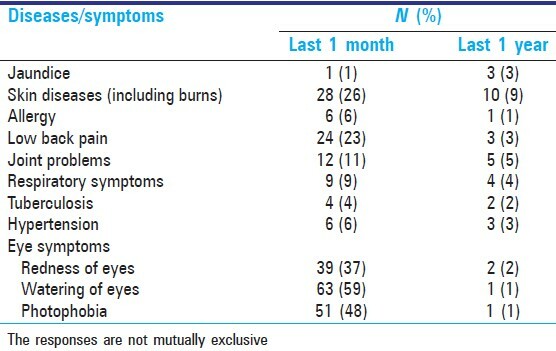 Eye symptoms were the most commonly reported symptoms such as watering of eyes (n = 63; 60%) followed by skin diseases (n = 24; 24%) and LBP (n = 23; 23%) in last month amongst the welders [Table 3]. Skin diseases were reported to be significantly common among group of welders who were exposed to dust and radiation for ≥4 hours in a day (P < 0.05). No significant association was found between eye, respiratory and musculoskeletal symptoms with the duration of exposure of different hazards. Though association with age and morbidities was found to be not significant, eye symptoms were found to be more common among younger age group [Table 4]. Welding is an important occupational activity in India, and as with other occupations, it is not without health risks. However, this population has been studied in limited extent in Indian settings. Therefore, the present study attempted to assess the duration of exposure to various hazards at workplace and presence of various morbidities among welders at the time of survey and a year prior to it. Although there are a vast number of processes, it has been estimated that shielded metal arc welding (SMAW, also known as manual metal arc welding, MMAW or stick welding) and gas metal arc welding (GMAW or metal inert gas welding) account for combinations practised by 70% of welders. Hence, study population chosen was primarily those involved with MMAW. Notably more than half of the respondents found their occupation to be physically hard and dangerous. This proportion is much lower than observed among welders in Benin City (91.6%)  and Kaduna Metropolis of Nigeria (77.9%). Lack of awareness about severity of risks associated with one's occupation aggravates the worker's health hazards in the work environment. Thus, this finding point towards the need for education of this group of workers about the workplace hazards. Welding operations led to production of gases and small solid particles, together known as welding smoke. Most of this is produced during arc welding. 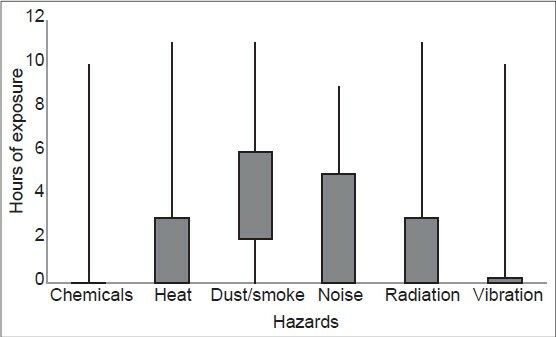 Evidently, in our study, welding smoke was reported to be the most common exposure at the work place followed by noise. The individual components of welding smoke can affect any part of the body. Skin diseases including burns were found to be significantly associated with increasing duration of exposure to dust/smoke. However, no association of duration of exposure was seen with respiratory and eye symptoms. This could probably be due to the fact that smoke causes both short and long-term effects pertaining to these body systems thereby negating the effect of duration of exposure. Also, there is a possibility where welders with severe respiratory diseases were not able to continue in the profession and have stopped working in the welding processes. Similar findings were obtained with radiation exposure. One of the limitations of the study was the cross-sectional design of the study. Moreover, results were based on observation over the study period, which may vary over different periods of time. Due to lack of comparison group, the results need to be interpreted with caution, in respect to association between hazard exposure and various ailments. Secondly, the assessment of exposure to various hazards was based on self-reporting by the workers, which could have been affected by the level of awareness among them. Lack of objective instruments such as ambient dust and smoke measurement, spirometry further contributed in underreporting of hazard exposure. However, the study does point out important hazards to which the welders are exposed in this part of the world. The study deciphered some interesting findings such as association of duration of exposure to various hazards to occurrence of skin diseases among welders. To conclude, there is need for proper health and safety training of this economically productive group on workplace hazards and ergonomics to reduce work related morbidities. Use of correct and adequate personal protective devices at workplace needs to be stressed among this cadre of workers. More research is required to quantify the effects of welding process and duration of exposure on health. 1. Kumara JT. A Study to assess the effectiveness of Self Instructional Module (SIM) on the awareness of selected Occupational Hazards and its Prevention among Welders at selected Workshops in Tumkur District. [Unpublished Dissertation]. Aruna College of Nursing, Karnataka: Rajiv Gandhi University of health Sciences. 2. Gulani KK. Principles and practice of community health nursing. 1 st ed. Delhi: Kumar Publishing House; 2008. p. 508-9. 3. World Health Organization (WHO). The World Health Report 1998-Life in the 21 st century: A vision for all. Geneva: WHO; 1998. p. 95-6. 4. Sabitu K, Iliyasu Z, Dauda MM. Awareness of occupational hazards and utilization of safety measures among welders in kaduna metropolis, Northern Nigeria. Ann Afr Med 2009;8:46-51. 5. Shaikh TQ, Bhojani FA. Occupational injuries and perceptions of hazards among road-side welding workers. J Pak Med Assoc 1991;41:187-8. 6. Norn M, Franck C. Long term changes in the outer part of the eye in welders. Prevalence of spheroid degeneration, pinguecula, pteryguim and cornea cicatrices. Acta Ophthalmol (Copenh) 1991;69:382-6. 7. Liss GM. Health effects of welding and cutting fume-an Update. [Internet] 1996. Available from: http://www.canoshweb.org/sites/canoshweb.org/files/odp/html/rp5.htm [Last accessed on 2013 Jun 12]. 8. Ashby HS. Welding Fume in the Workplace. Professional Safety 2002;4:55-60. 9. AFSCME. Health and Safety Factsheet. [Internet] 2013. Available from: http://www.afscme.org/news/publications/workplace-health-and-safety/fact-sheets/pdf/Welding-Hazards-AFSCME-fact-sheet.pdf [Last accessed on 2013 Jun 19]. 10. Workplace health and safety Bulletin. Welder's Guide to hazards of welding gases and fumes. [Internet] 2009. Available from: http://humanservices.alberta.ca/documents/WHS-PUB_ch032.pdf [Last accessed on 2013 Jun 06]. 11. Registrar General of India, GOI. 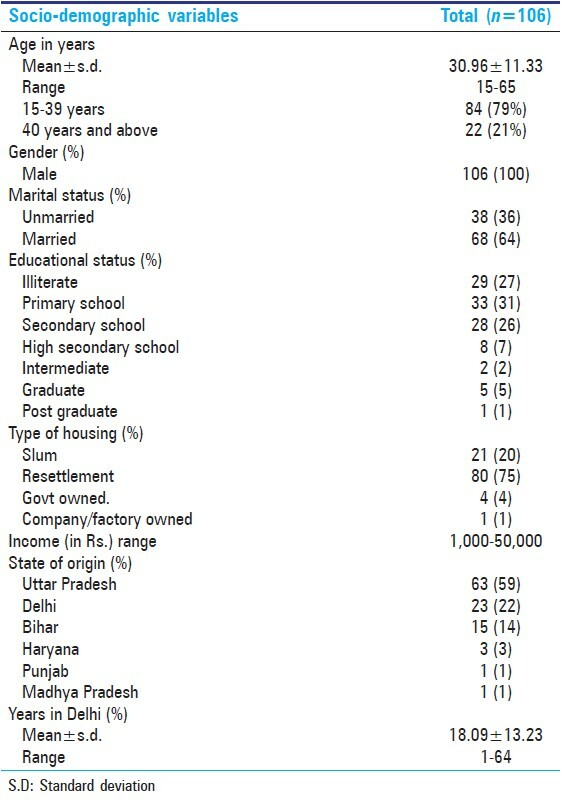 Census of India 2001: Data from the 2001 Census, including cities, villages and towns (Provisional). New Delhi: Census Commission of India; 2001. 12. Directorate of Economics and Statistics. Urban Slums in Delhi. [Internet] 2008-2009. Available from: http://www.environmentportal.in/files/UrbanSlum_65 th Round.pdf [Last accessed on 2013 May 15]. 13. Maria A. Urban Water Crisis in Delhi: Stakeholders responses and potential scenarios of evolution. [Internet] 2008. Available from: http://www.iddri.org/Publications/Collections/Idees-pour-le-debat/Id_0806_Maria_ Urban-Crisis-Water-Delhi.pdf [Last accessed on 2013 May 15]. 14. Definition of Skilled, Semi Skilled and Unskilled as per Delhi Minimum Wages. [Internet] 2013. Available from: http://hrsuccesstalk.com/forum/Thread-Definition-of-Skilled-Semi-Skilled-and-Un skilled-as-per-Delhi-Minimum-Wages [Last cited on 2013 May 30, Last accessed on 2013 Jun 16]. 15. Welding Information Centre. Welding Basics. [Internet] 2004. Available from: http://www.weldinginfocenter.com/basics/ba_02.html [Last accessed on 2013 Jun 16]. 16. National heart, lung and blood institute. The seventh report of the joint national committee on prevention, detection, evaluation and treatment of high blood pressure. U.S department of health and human services. [Internet]. 2004. Available from: http://www.nhlbi.nih.gov/guidelines/hypertension/jnc7full.pdf [Last cited 2013 Jun 19]. 17. Ehrlich GE. Low back pain. Bull World Health Organ 2003;81:671-6. 18. Isah EC, Okojie OH. Occupational Health Problems of Welders in Benin City, Nigeria. J Med Biomed Res 2006;5:64-9. 19. Census of India, 2001: Data Highlights. [Internet] 2001. Available from: http://censusindia.gov.in/Data_Products/Data_Highlights/Data_ Highlights_link/data_highlights_D1D2D3.pdf [Last accessed on 2013 Jun 18]. 20. Migration Study of Delhi and NCR. [Internet] 2005. Available from: http://ncrpb.nic.in/pdf_files/05_chapter%202_cma.pdf [Last accessed on 2013 Jun 18]. 21. Magnitude of Child Labour in India. [Internet] 2013. Available from: http://ncpcr.gov.in/Reports/Magnitude_of_Child_Labour_in_India_ An _Analysis_of_Official_Sources_of_Data_Draft.pdf [Last accessed on 2013 Jul 03]. 22. Pandve HT, Bhuyar PA. Need to focus on occupational health issues. Indian J Community Med 2008;33:132. 23. Magnusson ML. A review of Bio-mechanics and epidemiology of working postures. J Sound Vibrat 1998;215:965-76. 24. Life Line Online. Sitting can be hazardous to your health. [Internet] 2012. Available from: http://www.lhsfna.org/index.cfm?objectID=48355690-D56F-E6FA-964D881DB7999BF8 [Last accessed on 2013 Jun 19]. 25. Are welding fumes an occupational Health risk factor? [Internet] 2006. Available from: http://www.asse.org/practicespecialties/articles/weldingfumes.php [Last accessed on 2013 Jun 19].